Abstract: Aptly put by Dana R. Ferris (2014), the purpose of English-as-a-Second-Language (ESL) teachers giving feedback to their students in academic writing courses is “not just about eradicating errors in writing but also about helping their students to develop control of academic language” (p. 69). However, are the present strategies for giving feedback on language problems in academic writing moving towards this goal? Do the end-users of these strategies -the students- see their writing improve over time? If not, what kind of guidance are students looking for? This study aims at addressing these questions by doing a comparative study of the feedback strategies used by teachers and those preferred by students. Their responses are further analyzed to study whether the preferences change with types, frequency, and timing of language problems, and whether there are other modes of feedback that are equally if not more effective. Drawing on the responses received from teachers and students, the study presents critical implications of such a comparison between the preferences on ESL academic writing pedagogy and provides practical suggestions for the teaching faculty. In this research, I have analyzed morphological, syntactic, and lexical errors, along with errors in spelling, punctuation, and upper/lower cases. Language Problem: For the purpose of this study, I have gone beyond the realm of the above definition of an error and included other issues that students have with academic writing. These include using colloquial forms, questions in an essay’s body, personal expressions, choppy sentences, and unclear expressions (Hu, 2011). Almost all ESL teachers nowadays might agree that error treatment in ESL academic writing is a must and can be anything but detrimental to a student’s language growth. However, ESL theorists a few decades ago thought very differently. Now that it has been established that error treatment is required for L2 writers, the question that I ask by way of my research is, how should teachers give feedback on these errors? Should the feedback strategy change based on certain factors such as the type of problem, the frequency of the problem, and the timing of the problem during a semester? Is only written feedback effective or are there other ways of giving feedback? What do the L2 writers prefer; do they find the existing feedback strategies conducive to their language development? And most importantly, what are the implications for academia if teachers’ and students’ preferences for feedback strategies differ? 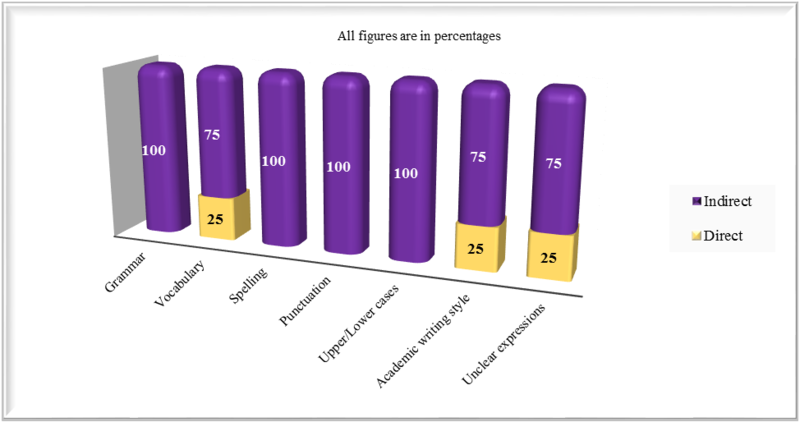 While research has investigated the views of L2 writers on error feedback strategies in academic writing (e.g., Hu, 2015; Lee, 2005, 2008; Leki, 1991) as well as L2 teachers’ beliefs on how to respond to language problems, (e.g., Ferris et al., 2011; Lee 2009), little research has directly compared teachers’ and students’ preferences. This study attempts to fill this gap by understanding whether there are discrepancies in the preferences and if so why and what can be done by students and teachers to bridge these differences in ways that are beneficial to both. 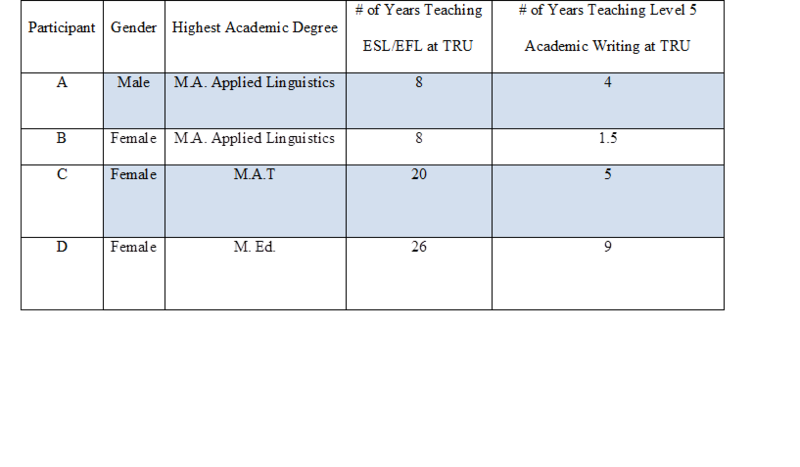 Four teachers teaching ESL academic-level 5 writing in a Canadian University were approached for the study. They in turn recommended two or three students from their respective classes to participate in the study. The data was collected in the form of personal, semi-structured qualitative 30-minute interviews with the students and the teachers at a location within the university. All the conversations were audio-recorded and kept confidential. In order to conduct the interviews, ethics approval was sought from the Research and Ethics Board of the university. All the teachers and students were made to sign a consent form indicating that their identities will be kept anonymous and that they are under no duress to participate in the study. As teachers were recommending students for the research, an additional clause was added in the teachers’ consent forms that there will be no coercion or impact on the students’ grade or progression if the students wished to withdraw or do not want to participate. All the teachers had the required qualifications to teach ESL and at least five years of experience in teaching L2 writers. Table 1 gives brief details about the teachers interviewed in this research. 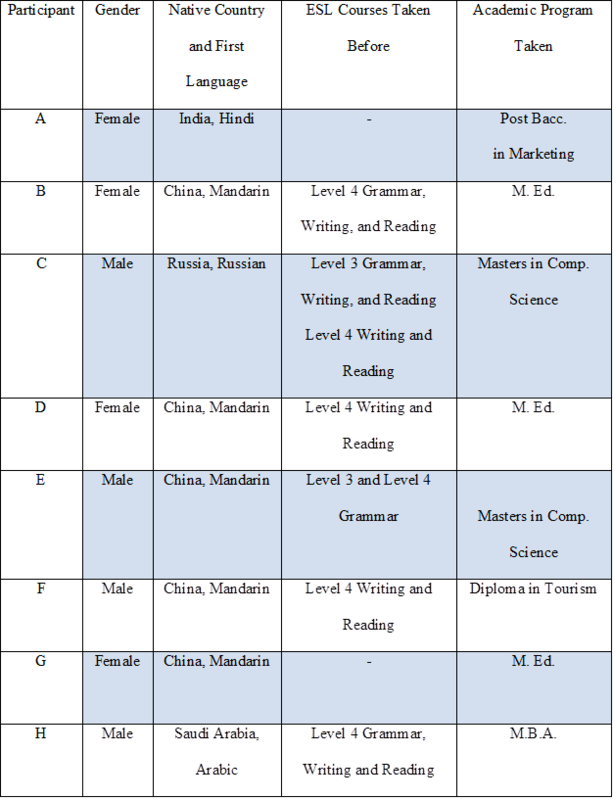 A majority of the students belonged to the “International/visa students” category of L2 writers. Back in their home countries, they had studied English in high school with prominence being given to grammar and vocabulary. However, it is the lack of application of the rules in real-time contexts that makes them reluctant to confidently use the language. Error correction was a major component of language instruction for everyone, though students were rarely given a chance to rework their drafts. There were few opportunities to have one-on-one conferences with their teachers regarding language clarifications. Only one-third of the students had taken a prior grammar class in this university and were therefore familiar with the grammatical rules. For the others, their grammar knowledge had fossilized. The study was conducted in a Canadian classroom setting where the principles and methodologies of teaching are mostly North American. This might not encompass a large part of the teaching strategies used in other parts of the world. Another major limitation of this study is that the interviewed students were chosen by their respective L2 teachers, thereby adding an element of bias. However, when interviewing the students and what is also evident in the results, the students have been candid in their views and have not shown any form of bias for their teaching faculty. Finally, the sample size is relatively small and therefore the results might not mirror the views of a larger L2 student population. Type of errors; whether teachers and students prefer direct or indirect feedback depending on the kind of error, such as grammar, punctuation etc. Finally, I asked teachers and students whether they would prefer a mode other than written corrective feedback, such as one-on-one conferencing. The results lead into the inferences drawn followed by implications and some suggestions for academia based on the study’s results. Q1. What strategies in general do teachers and students prefer when giving and receiving feedback respectively for academic-level 5 writing? Most of the teachers preferred to give more indirect feedback by marking the error using a code or some verbal comments. The premise for this was that all the students in academic-level 5 writing have had some basic to intermediate instruction about English grammar and therefore they should be able to correct the errors if told what kind of error it is. These set of teachers feel that giving the answer by marking directly will impede in the betterment process of students’ language development. The few teachers who preferred marking directly – marking the error as well as giving the answer through verbal comments – chose to do this only in certain situations where they felt that students might not be able to correct the error by themselves, such as incorrect word choice. For every other issue, these set of teachers too preferred marking indirectly. 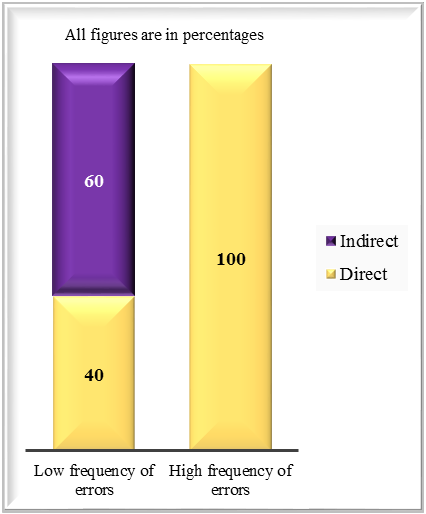 Previous research done on the usefulness and drawbacks of using direct and indirect feedback have given mixed results. On one hand, it has been argued “that indirect feedback is more helpful to student writers in most cases because it leads to greater cognitive engagement, reflection, and problem-solving.” (Ferris, 2014, p. 32). In recent times, however, several “SLA researchers” have found that direct feedback is better for “students’ update and retention of information about targeted language forms such as articles”. (Ferris, 2014, p. 32) Essentially, there are 3 situations where teachers can use direct feedback “judiciously”: “when students are at beginning levels of English proficiency; when errors are untreatable (such as idiomatic phrases, word choice, and word form where teachers cannot refer to a specific rule for error correction), and when the teacher wishes to focus student attention on particular error patterns but not others” (Ferris, 2014, p. 95). One of the practical applications of direct feedback is the technique of “reformulation”, where the teacher rewrites the incorrect or awkward sentences to suit the given context. (Ferris, 2014, p. 97) This approach though has not been accepted by the ESL community with a lot of confidence as there has not been any definitive research to prove its long-term effectiveness in improving students’ language proficiency, and it is time consuming for teachers. To summarize, for “written accuracy”, “clear, narrow, and explicit feedback (direct feedback) might help students to master the structure in question”. For self-editing strategies, “a process of ‘guided learning and problem-solving’ (indirect feedback) may better serve the long-term objective of fostering student autonomy in monitoring their own writing.” (Ferris, 2014, p. 33). This was one of the feedback strategies that both the teachers and students agreed on. They preferred to give and receive feedback respectively on all the error categories as opposed to just a few. This is because teachers do not want to convey the wrong message that the student in question has only those errors to work on that were marked in the document. 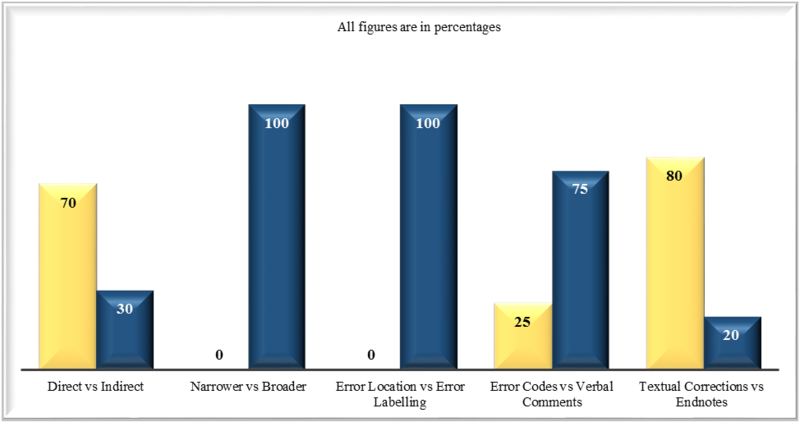 Students as part of other research conducted on this aspect of error correction also support these results; in work done by Leki, Ferris and Roberts, and Rennie (as cited in Ferris, 2014, p. 45), most of the students preferred comprehensive error correction, except for a few who wanted feedback on their “most serious errors”. However, some L2 writing experts think otherwise. While the teachers had equal reactions to both methods, the students had a clear opinion. Some teachers preferred to make textual corrections – marking errors precisely where the error was made – because it is easier to review the document to assess the types of language problems the students have. The other set of teachers prefer writing summarizing notes at the end of the document when they want to focus more on the ideas and the construction of the writing than its grammatical aspects. Most of the students though preferred to have error marked next to the relevant sentence as endnotes seem vague and unhelpful to them when wanting to know the specific language problems they have to work on. Q2. Based on the types of language problems, do teachers and students prefer direct feedback or indirect feedback? While the general instinct of teachers is to give indirect feedback to students for language problems in writing, when broken down by types of errors, they also consider giving direct feedback. For errors in grammar, spelling, punctuation, and upper/lower cases teachers feel that directly giving the answer will hamper the language development of students. There will be no motivation left from the students’ end to try and find out how to correct the error and refer to grammar textbooks. Therefore, it might serve the immediate purpose of correcting the errors in the said document but the students will not learn from their mistakes and carry forward their learning to the next document. The teachers are willing though to consider direct feedback in cases where the students might not be able to self-edit, such as incorrect word choice, academic writing style, and unclear or awkward phrases. Most students refer to online translation guides that might serve them good for most part of their document but might misguide them at times regarding choice of words. In such a situation, teachers prefer to write the exact word that suits the context of the sentence. Similarly, almost all of the students are not aware of the academic writing style expected in a Canadian classroom; it might be completely different from what they are used to in their native countries. Therefore, teachers prefer to be explicit when it comes to giving feedback about this aspect. This form of direct feedback is usually given by labelling the errors using error codes along with appropriate verbal comments. The students, interestingly, have a very different view regarding feedback on specific error types. Students would generally prefer direct feedback for all error types. But given a choice, they would accept indirect feedback for problems with spelling, punctuation, and upper/lower cases. When probed further and asked whether giving direct feedback all the time will help them in the long run, the students had an interesting response. They were quite clear that when they said they want direct feedback, they were not really looking for the answer to the error, except for instances such as incorrect word choice, academic writing style issues, and awkward expressions where they were in sync with teachers’ views. What they are really looking for is how to take the next step after knowing that it’s a verb tense error or article error. They are not sure why the verb tense or article that they chose was incorrect, where to look for help with verb tenses or articles, and then how to ultimately correct the error. This perception goes in line with the fact that more than half of the students in this study have not taken any prior grammar courses where they were taught how to correct error and self-edit their work. This gap calls for some interventions from the teaching faculty, which are outlined in the ‘Suggestions for Academia’ section. Q3. Based on the frequency of language problems, do teachers and students prefer direct feedback or indirect feedback? Whether a student is making the same error once or is repeating the error in subsequent drafts, most teachers do not change their method of giving feedback if a student is repeating an error. They feel that the student is repeating the error either because of negligence or lack of motivation, not because of not knowing how to correct the error. As a contrast, if a student is repeating an error in subsequent drafts, students prefer to receive more direct feedback as they have not been able to correct the error themselves. 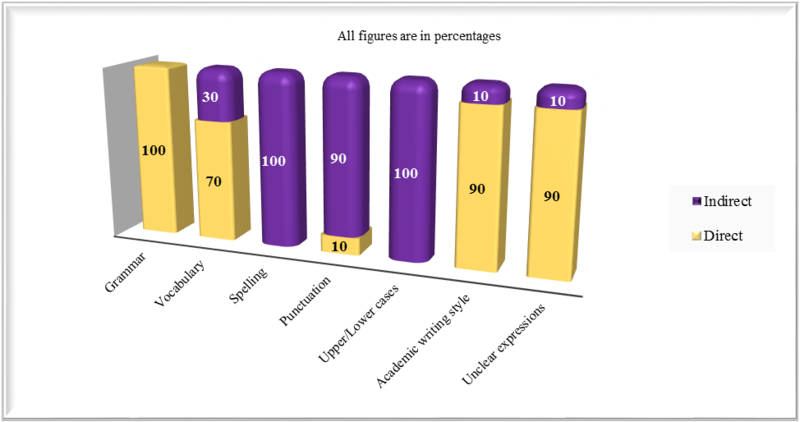 If the frequency of the error is relatively low, students are open to receiving indirect feedback in the areas of spelling, punctuation, and upper/lower cases. Q4. 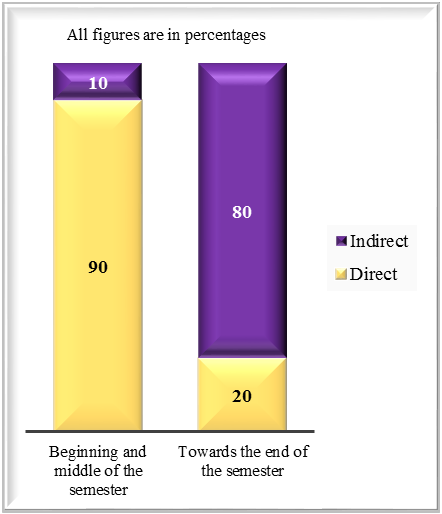 Based on the timing of the language problems during a semester, do teachers and students prefer direct feedback or indirect feedback? Irrespective of when the errors are made, be it at the beginning of the semester or towards the end, teachers only believe in giving indirect feedback. However, most students feel that during the start of the semester, teachers should give more direct feedback so that students can understand what the reasons for the errors are. Once they are about a month into the semester, they can receive indirect feedback as by then the expectation is that the student knows how to correct the error. Q5. Other than written feedback, are other modes of feedback such as one-on-one conferencing used? If so, how useful are they as compared to written feedback? Both teachers and students unanimously felt that one-on-one conferencing with the teacher was helpful. Further, they felt that neither written feedback nor conferencing would be as effective separately as they are as a combination. They preferred scheduling a conference with the teacher two to three days after getting written feedback. This way, the students got sufficient time to analyze the marked errors and go to the teacher with any residual clarifications. Some of the teachers felt that despite them marking comprehensively, students tend to repeat errors in subsequent drafts. Teachers then have to spend substantial amounts of time in correcting the same errors again and again. While talking to the students, some of them expressed that they were not sure of the various rules of APA and MLA citation formats. For those who had taken academic-level 5 writing classes before, they followed a different citation style and now they were following a different style. Students also felt that when choosing the appropriate word, they were not sure how to interpret the dictionary and thesaurus accurately. Some students also had difficulties in understanding the handwriting of teachers. Most of the students were unsure of the relevance of fiction in their academic writing classes. They felt that since academic-level 5 is a pre-cursor to their actual academic courses, they should be given to read more academic texts from various fields. While teachers were marking errors, students felt that substantial parts of their writing was being rewritten. The students were confused as to whether they were being marked for errors or for their writing styles. For many years, ESL researchers have been trying to find out the most effective way of giving feedback to students for their writing. Some say written corrective feedback is needed and some others say that giving feedback is hampering the natural thinking process of the student. At this point then, it is imperative for us to stop and step back to look at the big picture. But if we were to view the larger picture, Manchon asks a very pertinent question: are ESL students “learning to write” or “writing to learn”? (as cited in Hyland, K., 2013, p. 241) To answer this and the other questions in this study, we might need to step back a little and analyze the learning curve of an ESL student. It is evident from the previous discussion that the focus of ESL instruction and the expectations from ESL students vary considerably as they progress from high school to the workplace. The most significant jump in expectations though in the entire learning curve of an ESL student is from the ESL courses to the academic courses. ESL teachers see ‘writing effectively’ as the ultimate goal, whereas academic teachers see writing only as a tool to effectively communicate subject-related content. This contrast also has a direct impact on the feedback strategies used by teachers; whether the goal of error correction is to correct the immediate errors in a document or to build a foundation to enable students to view the narrower picture of grammatical errors to the bigger picture of ideas construction. Consequently, to meet the twin objectives of enabling students in “learning to write” and “writing to learn”, the following section outlines some practical suggestions for ESL pedagogy. Teachers need to have an understanding of the second language acquisition process to be able to understand error patterns made by students. “Influence of Specific L1s”- For instance, “native speakers of Japanese may struggle with using English articles, Chinese speakers may have trouble with the verb tense system, Russian speakers may have difficulty with word order, and Arabic and Spanish speakers may make errors in sentence boundaries”. (Ferris, 2014, p. 85). Having an understanding about these characteristics will help teachers in tailoring feedback to meet individual language concerns. 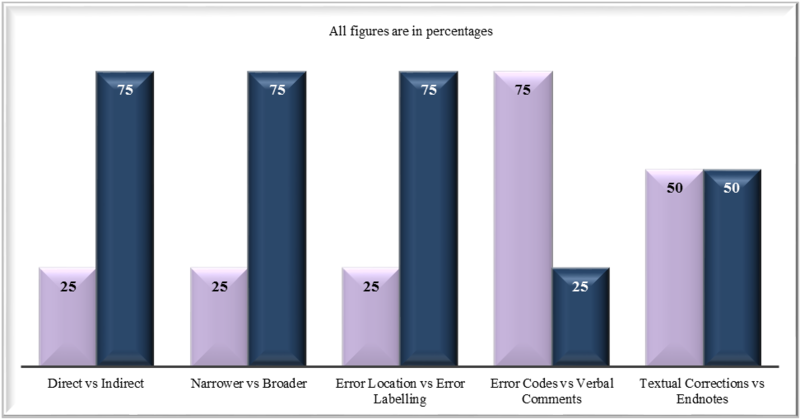 Type, frequency, and timing of errors- As is evident from the results of this study, students prefer to receive direct feedback for areas such as grammar, when errors are repeated, and during the start of the semester. Teachers who generally give indirect feedback might benefit from this perspective of students. To be uniform in correction methodologies and to encourage standardization, the ESL department could discuss the standards of correcting a student’s paper: the parameters for correction; the parameters where teachers are allowed to be subjective; and whether to mark comprehensively or selectively and the implications of each method. Prior to beginning the curriculum of the ESL course, the teacher can conduct a diagnostic test on the lines of a descriptive essay for about 10 -12 lines. This will give an idea to the teacher about the students’ level of proficiency in both grammar as well as organization of ideas. With this information in mind, the teacher can fine tune feedback accordingly. Teacher can make a class error profile list, which lists the percentage of errors for a student in each category of error. (Ferris, 2014, p. 89) Once the teacher gets an idea of which kind of errors are common for the class, the teacher can either have a special class to address that topic or direct students to the writing center where the writing center can take a session on that topic. This way the pressure is off the teacher and the students also get a chance to clarify questions as a group. An important point to note here is when teachers ask students to go to the writing center, the writing center head should be advised beforehand that the focus of the session should be on the grammatical topic and not on grammatical accuracy of the specific paper. For the first piece of work that is corrected, the teacher can have a session in class where students bring their marked paper and correct the errors in class. If the teacher finds that a number of students are coming to him/her with a common issue, it can be addressed towards the end of the class. This is a useful practice to follow that not only provides clarification to students on how to correct their errors after receiving feedback, but this will also reduce the frequency of errors in the following drafts. Identifying those grammatical aspects that most of the students have issues with. To get this data, error charts prepared at the end of the first paper will help. Using grammar resources that explain the concept(s) in a simple manner and give relevant examples. For more clarification on the various citation formats, as some students in this study had expressed difficulty in understanding, the Writing Center could be requested to conduct a two-hour workshop. For students that have not done any writing or grammar course before academic- level 5, it might help to give them names of some simple grammar books that they could refer to for correcting their language problems. At the beginning of the semester, it might help to teach students how to effectively use the entries in a dictionary and thesaurus. If the teacher is using error codes, to have one class dedicated to understanding the error codes, examples of errors that fall under those error codes, and how to correct the error using the code. Apart from written feedback methodologies, teachers can also use methods such as peer editing. (Ferris, 2014, p. 147) This is especially helpful in the beginning where students are likely to make more errors and they get a chance to understand what it is like to proof-read a paper. Lastly, preparing a well-rounded feedback environment for students requires immense effort from the teachers which might ultimately lead to teacher burnout. (Ferris, 2014, p. 110) While seeking assistance from the writing center is one of the ways to get the pressure off teachers, making students gradually move towards self-editing will considerably ease the efforts of teachers in the long run. By making students identify their persistent error patterns obtained from their error logs, students can keep track of their progress and will also be motivated to move towards error-free documents. Similarly, using a self-editing checklist be extremely useful in eliminating glaring errors in a draft (refer to appendix). 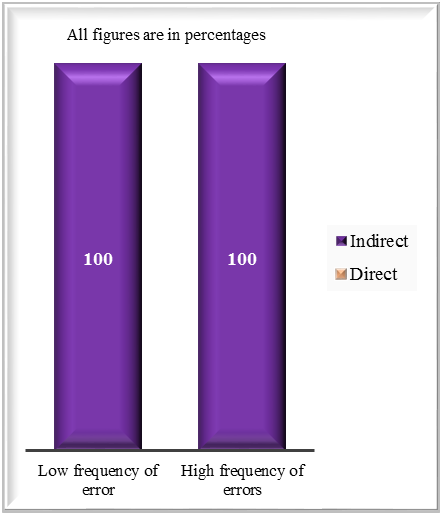 An important aspect that required further study is whether the suggestions offered by the interviewed students as well as in this paper are effective in an actual classroom scenario. Based on the feedback from implementation of the suggestions, more analysis can be done in this field. Ferris, D. R. (2014). Treatment of Error in Second Language Writing. Ann Arbor: The University of Michigan Press. Ferris, D.R, Liu, H., & Rabie, B. (2011). “The job of teaching writing”: Teacher views of responding to student writing. Writing and Pedagogy, 3, 39-77. Hu, J. & Hoare, A. (in review). Language problems in ESL writing: Voices of employers. The International Journal of Leadership in Learning. Lee, I. (2005). Error correction in the L2 writing classroom: What do students think? TESL Canada Journal, 22(2), 1-16. Lee, I. (2008). Student reactions to teacher feedback in two Hong Kong secondary classrooms. Journal of Second Language Writing, 17(3), 144-164. Lee, I. (2009). Ten mismatches between teachers’ beliefs and written feedback practice. ELT Journal, 63(1), 13-22. Leki, I. (1991). 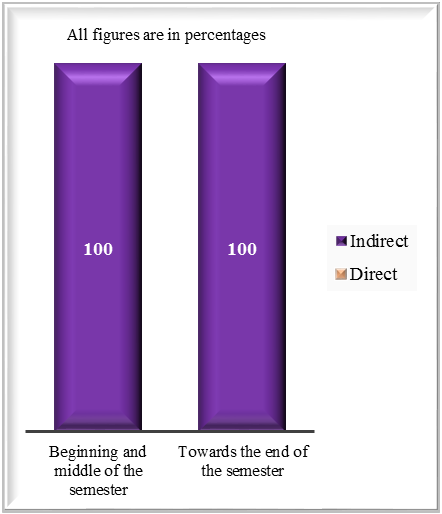 The preferences of ESL students for error correction in college-level writing classes. Foreign Language Annuals, 24, 203-218.